The United States Congress designated the Ruby Mountains Wilderness (map) in 1989 and it now has a total of 92,652 acres. All of this wilderness is located in Nevada and is managed by the Forest Service. Glaciers scoured the northern end of the Ruby Mountains during the last ice age, creating the U-shaped Lamoille Canyon, also known as Nevada's Yosemite. Hanging valleys, towering summits, and year-round snowfields characterize this Wilderness. South of Lamoille you'll encounter seven miles of lake basins and meadows before the terrain south of North Furlong Lake turns into a narrow, grassy ridge that runs approximately 15 miles to the Overland Lake basin. The Rubies contain 10 peaks above 11,000 feet (including Ruby Dome at 11,387 feet) and more than two dozen alpine lakes, rare treats in this arid state. You'll also find here one of the largest herds of mule deer in Nevada, numbers of mountain goats and bighorn sheep, and streams teeming with trout (including the threatened Lahontan cutthroat). Himalayan snowcocks have been introduced and are doing well. Prehistoric hunting blinds and once-inhabited caves on high ridges indicate that this area has been in use for a long time. The Ruby Crest National Recreation Trail travels along the top of this Wilderness for 33 miles. Shorter side trails climb to the crest from several trailheads. 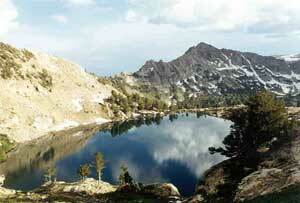 Planning to Visit the Ruby Mountains Wilderness? How to follow the seven standard Leave No Trace principles differs in different parts of the country (desert vs. Rocky Mountains). Click on any of the principles listed below to learn more about how they apply in the Ruby Mountains Wilderness.